OK, perhaps "man overboard" is not the correct term anymore but statistics show that more guys go overboard than gals. 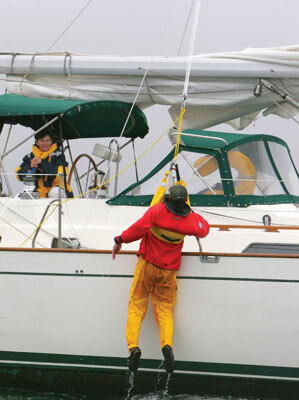 The question is how do you get someone who has fallen overboard back on your boat? The most common answer I hear is "using the ladder on the swim platform". While that might work if it is flat calm and the victim is able to climb it will not work in most situations. The swim platform becomes a weapon in any type of sea, moving up and down with great force looking for a head to smash. You need to figure a recovery method that works on the lee (downwind) side of the boat. A 5:1 block and tackle is great if you have a high enough place to mount it. Some crews figure they will use their davit and others have tools like a Jason's Cradle to help with the task. If you are looking for LifeSling's or replacement covers, that product is made by West Marine and recently they have been selling these products to end users (boat owners) for less than the prices offered to their wholesale customers (companies like mine).